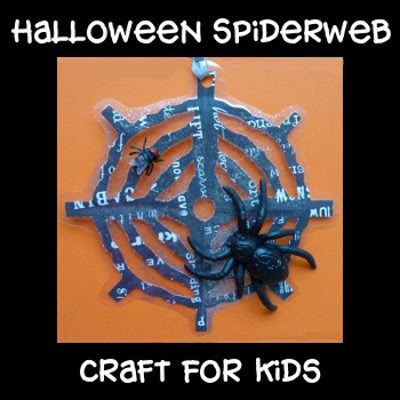 Spider webs and cobwebs make wonderfully creepy and fun decorations that you can use for Halloween. 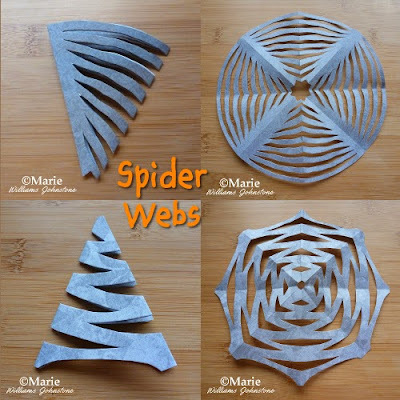 This ever so easy spiderweb paper craft uses the exact same paper folding and cutting technique which is often used when making those pretty paper snowflakes. Laminating the design makes it perfect for displaying around your home and in your windows this October. We finished our designs off by adding on a plastic toy spider and a fly. It's a creepy craft that is perfect for making with large groups of kids since all you really need is paper and scissors. You can stick the webs onto card or a nice contrasting colored paper. Come and see how it's done. You can turn your completed spiderweb paper craft into a more robust hanging ornament by laminating the finished design. This is a craft that can be done by children who are able to cut using child-friendly scissors and it is even demonstrated by my young (then 6 year old) child to prove that it isn't too hard. Step 1: Choose some paper to work with. I prefer lovely patterned scrapbook papers in suitable colors and styles for this occasion. These will look nicer as finished hanging decorations. 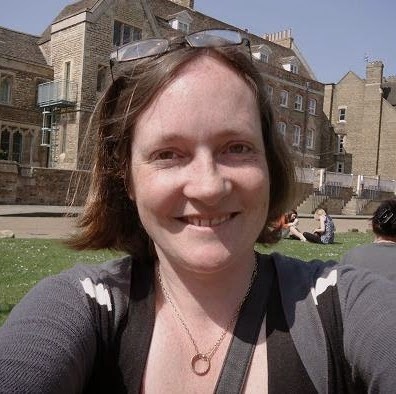 However, they're more expensive than other papers and not really practical for kids to use since they can get through loads of paper very fast. Colors that make great spider webs for Halloween are black, white, silver and gray but my daughter thinks that bright blue is the best! Step 2: Draw around something round like a plate to make a circle or use a large compass instead. Try different sized circles to work with but not too small because they get too fiddly to fold and cut. Step 3: Cut out the circle shape and discard the offcuts of paper. For the majority of my papercrafts, I use scrapbook papers because they are nice and thick, good quality and I love all the patterns that you can get. These are used for finished products like decorations and cards. My daughter uses brightly colored construction and craft papers which are more practical for her to go through and use. Step 4: Fold the circle in half. I like to have the printed side on the outside once folded but it doesn't really matter which way you do it. Step 5: Fold the paper in half again to make a wide cone shape. Step 6: Fold the paper in half again for a total of three folds. You should now see a narrow cone shape - a bit like the shape of an ice cream cone. Step 7: The image for this part shows the cut pattern that I'm using. Bear in mind that there are many patterns which make good looking paper webs. What seems to work best is cutting river shapes across the sides of the paper or long grooves and channels. Just be careful not to cut right across. You can cut from either side so long as you don't go too near the other edge. Step 8: This image shows what pattern is made from the cuts in the image from step 7. I have some more examples just below in the photo but it is best if you come up with your own style for a spider web. And children often like to make up their own designs too and to experiment. Step 9: I like to laminate the paper webs for a number of reasons: it makes them more sturdy for hanging, you can see through all the holes which makes a nice window decoration, it makes them stronger to stick items like toy plastic spiders on and you can re-use these for the next Halloween. If you don't have access to a laminating machine then stick the webs onto card or a contrasting color paper - glitter papers and cards would make great backgrounds. Step 10: Pop as many webs into a laminating sheet or pouch as you can. I can easily fit two smaller ones into one sheet. I sprinkled some silver glitter powder inside the sheet too. Step 11: When the laminating machine is ready to use, an adult can place the closed laminating sheet or pouch into the machine. Leave it to cool after the sheet pops out at the other end. Step 12: Cut neatly around the laminated webs and punch a hole into the top where you can thread some string or ribbon for hanging. Step 13: Add on any further decorations that you like. We choose a toy plastic spider and fly to stick onto the creepy web. Now go hang it up! They look fun dangling in the window. Since we bought a laminating machine, we've never looked back. My daughter loves it when we preserve her artwork and collages that she makes. We make our own wipe-clean sheets by printing out worksheets from the Internet that she can work on with white board markers that wipe off so she can repeat activities again. Photos get laminated, favorite recipes to keep clean in the kitchen and fun items like bookmarks too. I hope you've enjoyed reading my justhalloweencrafts page today, thanks for your visit. Have fun this spook time season.